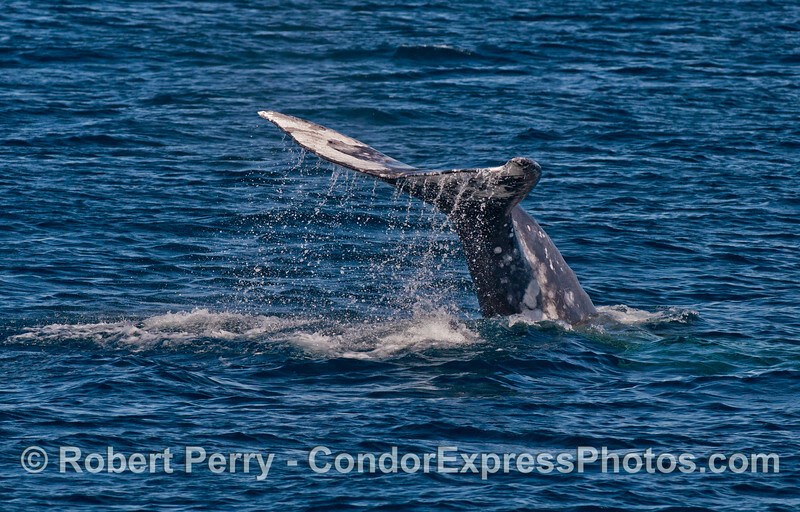 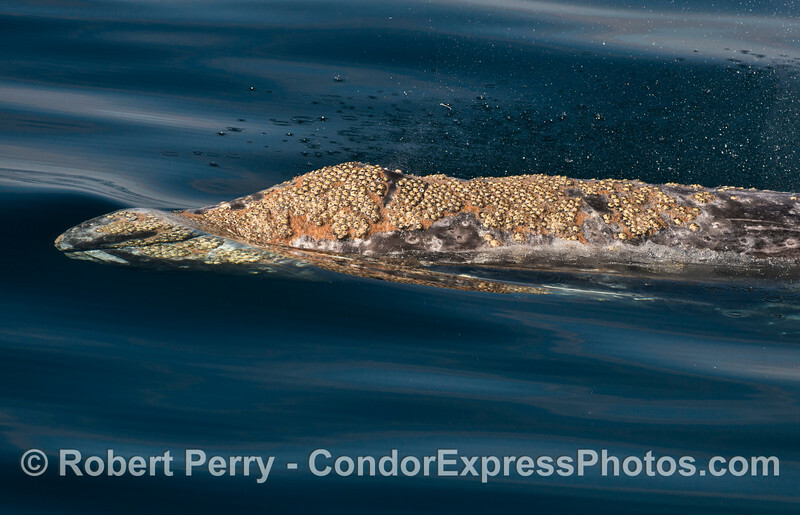 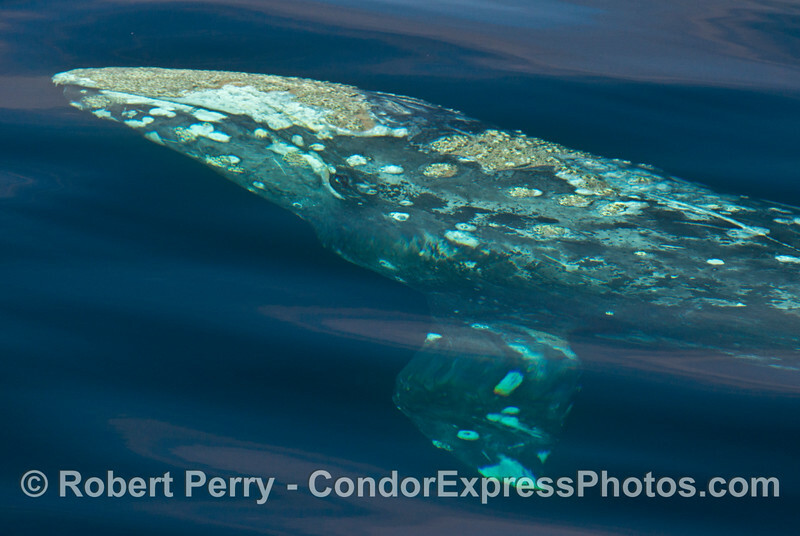 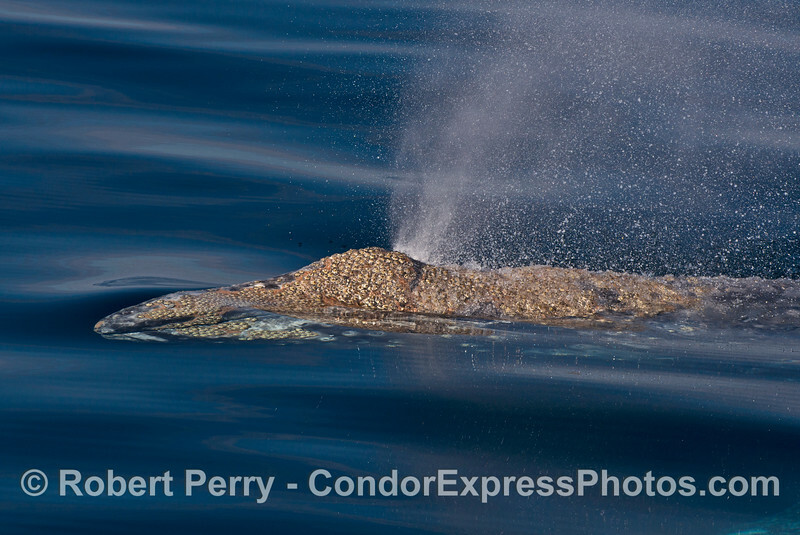 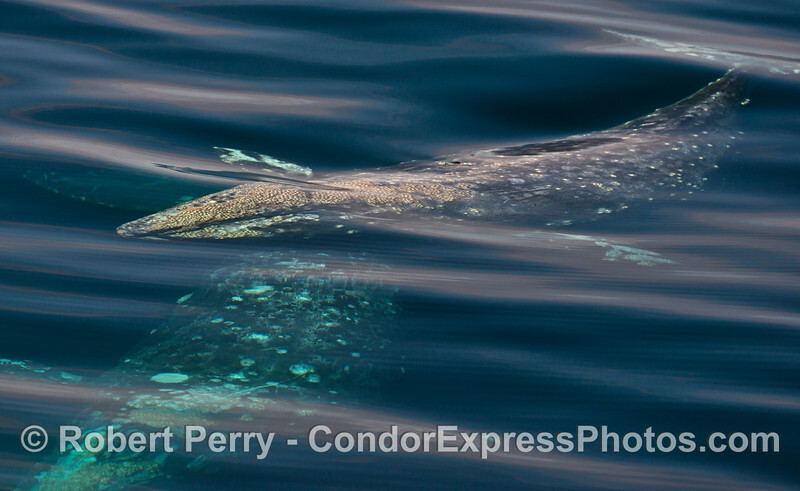 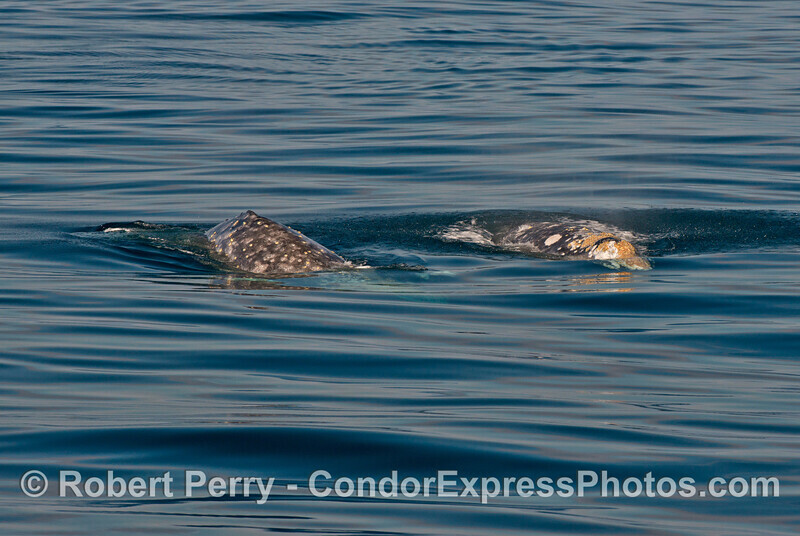 Among the many cetaceans, 2 gray whales stole the show. 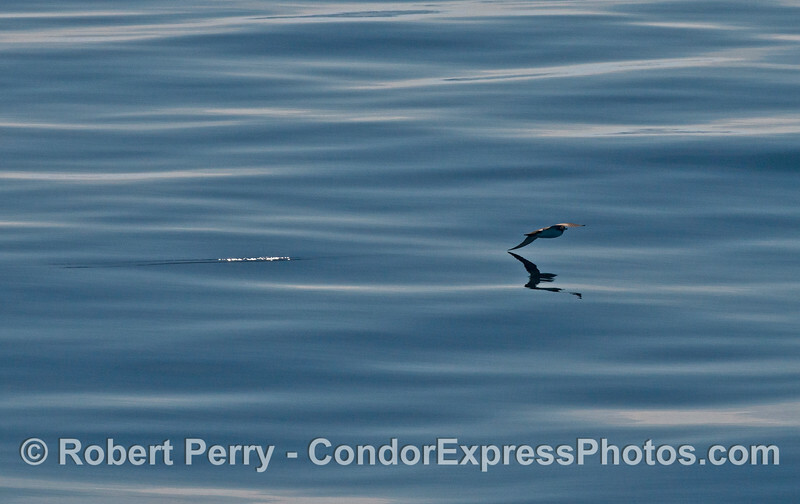 It was mirror glass, mill pond flat all day today except for a very light breeze in a few spots near the mouth of the Santa Cruz Channel. 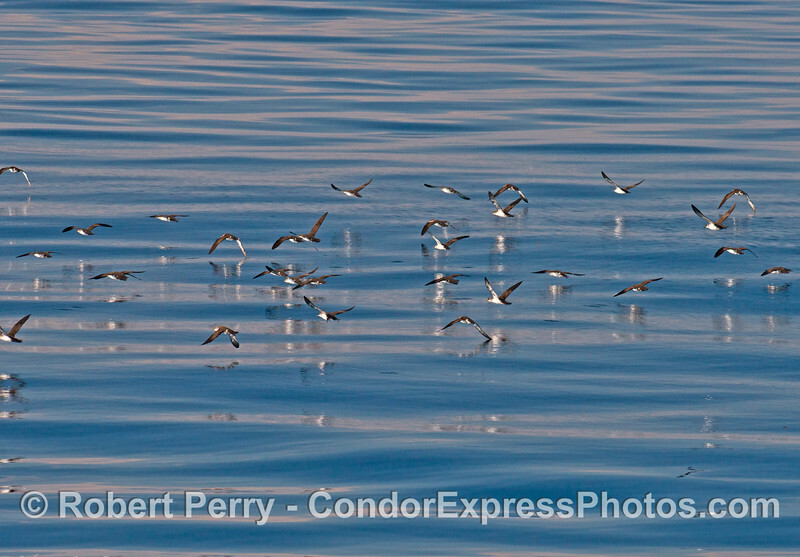 It was bright and sunny and you could see all 4 Santa Barbara Channel Islands. 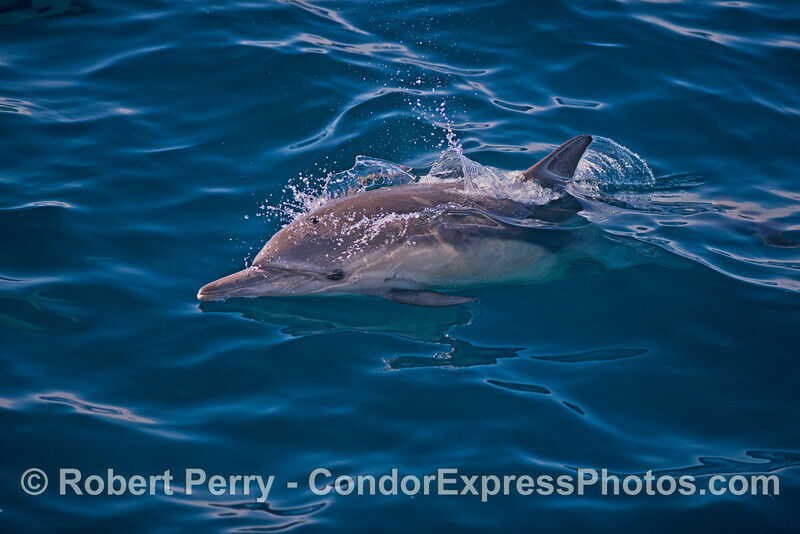 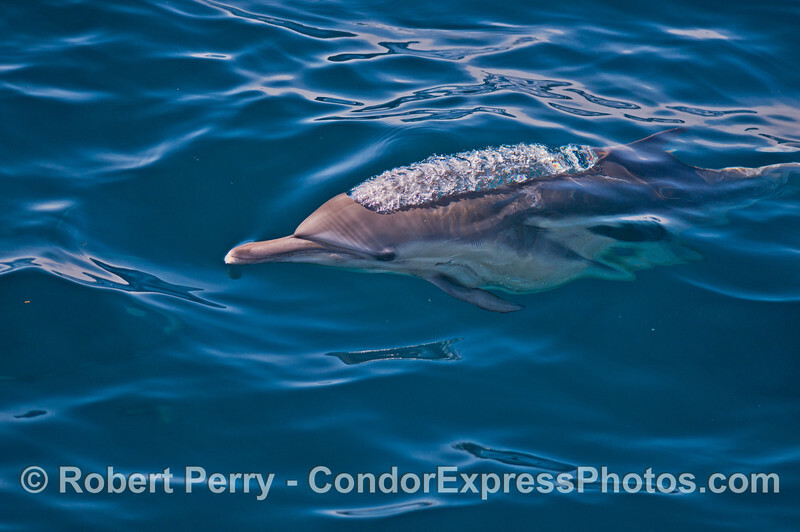 Our first sighting was a mega-pod of at least 1,000 long beaked common dolphins found about a mile north of the sea cliffs of Santa Cruz Island. 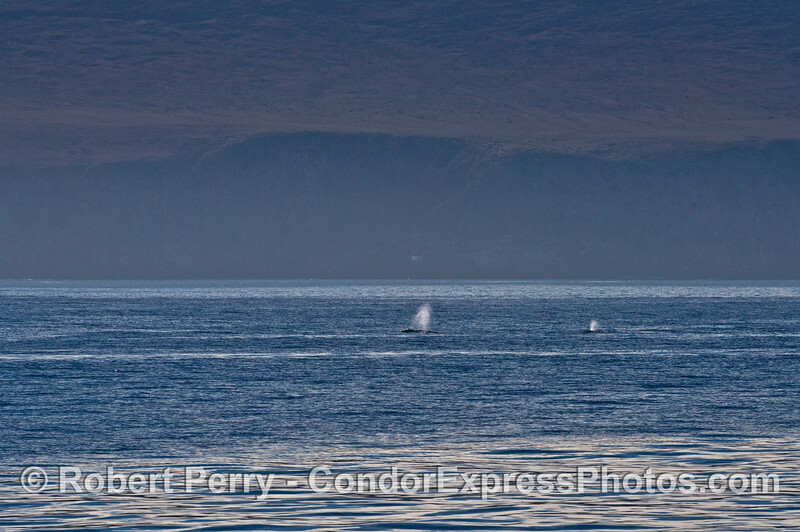 We played with them for about 20 minutes, and as they were heading east and we wanted to head west, we left this amazing pod and went on our way. 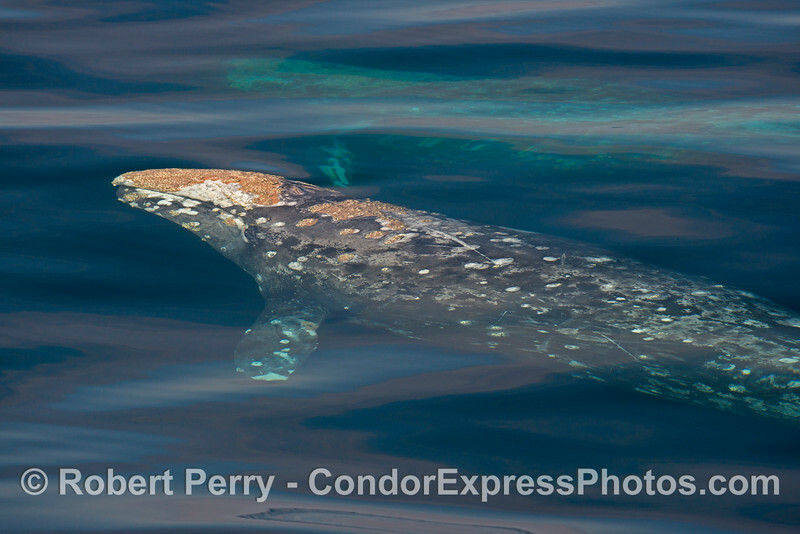 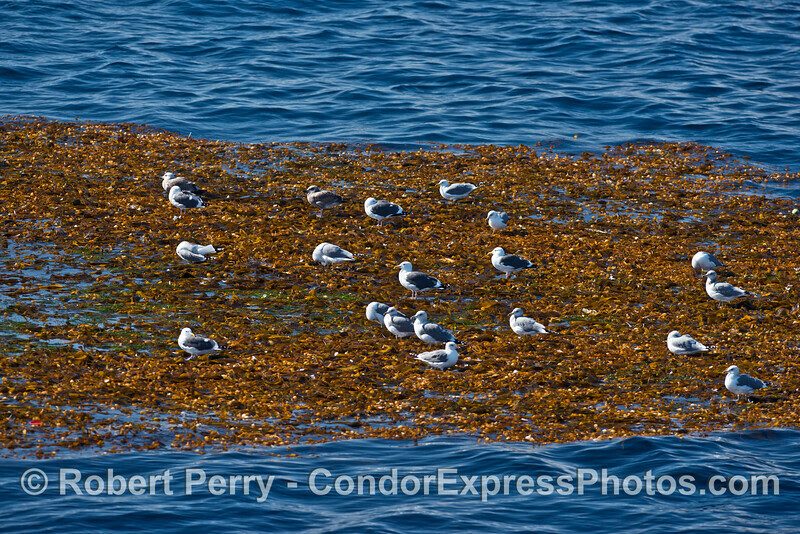 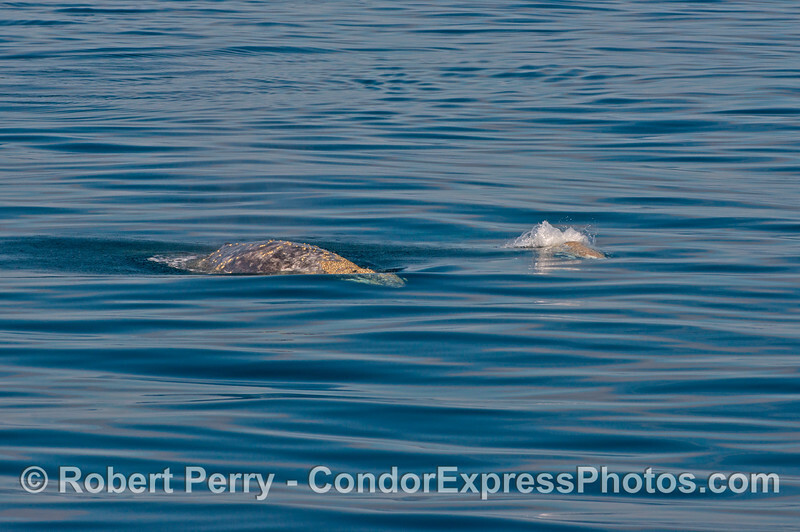 Off the West Point of Santa Cruz Island we found at least 100 big gray Risso's dolphins. 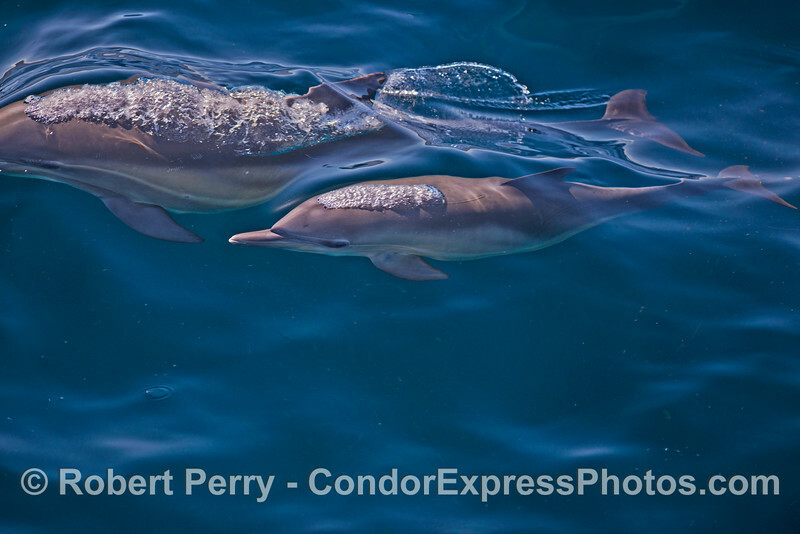 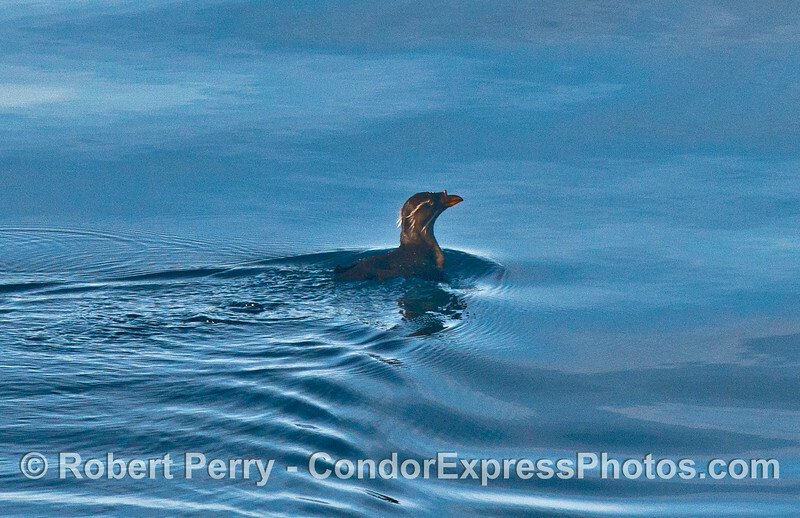 They cavorted near the Condor Express and gave wonderful looks to all. 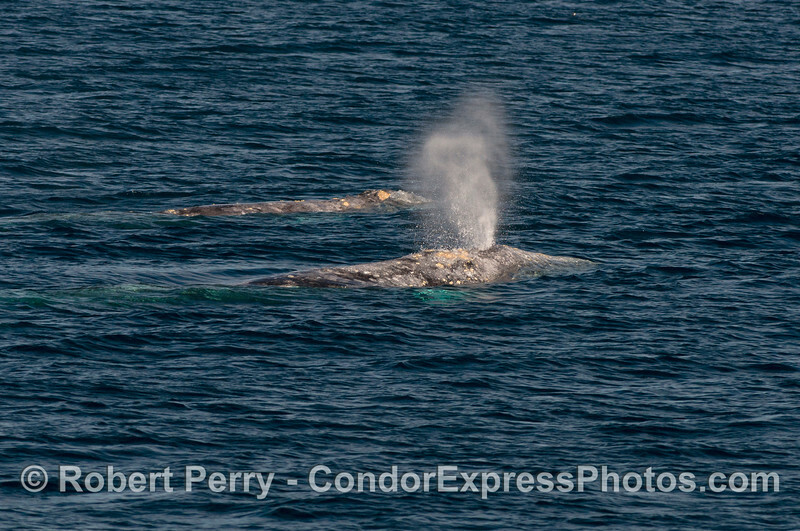 While watching the Risso's, several tall spouts were seen further out into the mouth of Santa Cruz Channel which turned out to be the first pair of a total of 6 gray whales we watched today. 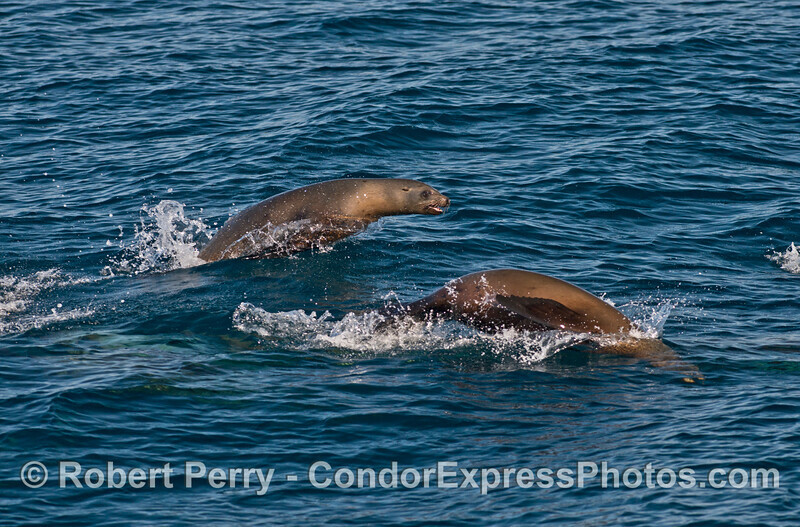 However, it was the second pair, a bit closer to Santa Cruz Island, that would eventually send shivers down my spine and cause us all to have momentary heart palpitations. 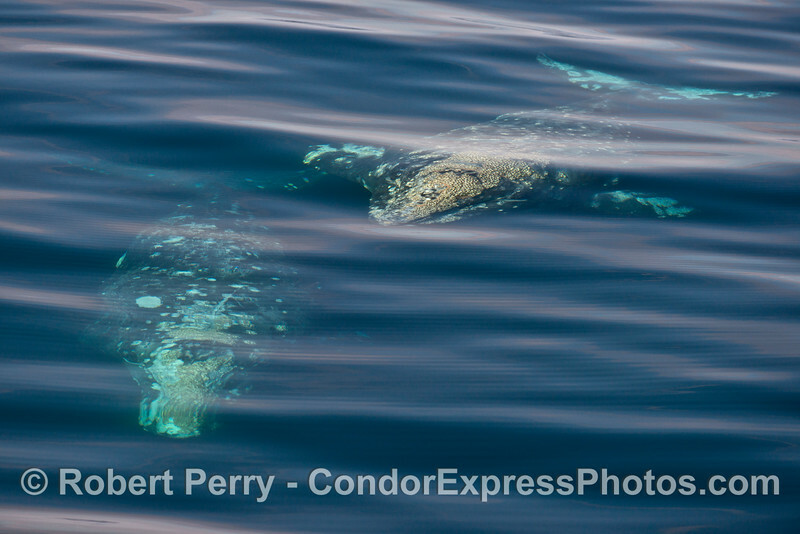 We had been watching the two gray whales for a while and then they turned off their easterly course and headed south, straight at the boat. 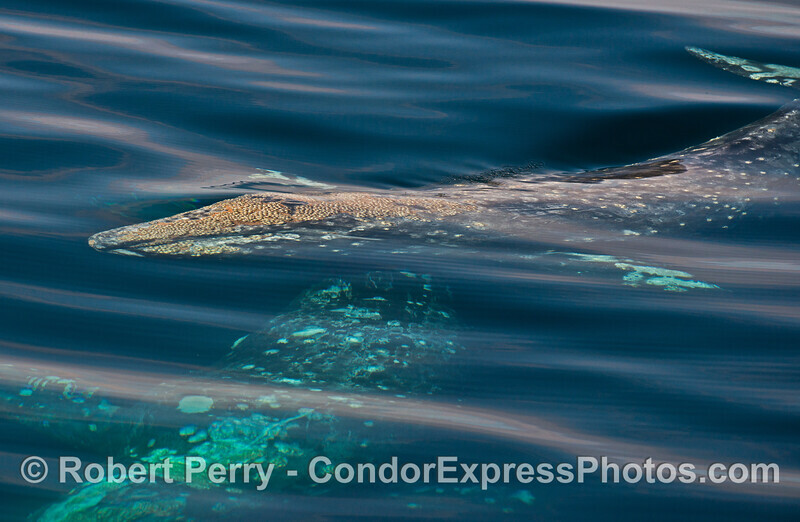 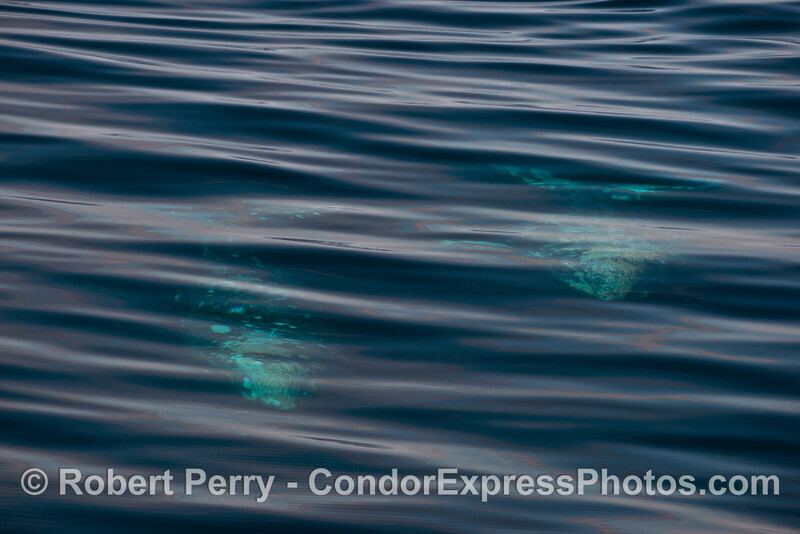 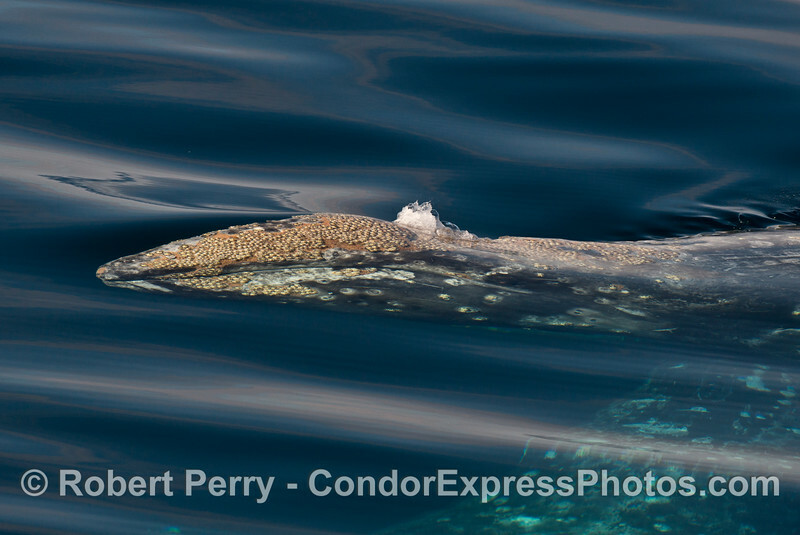 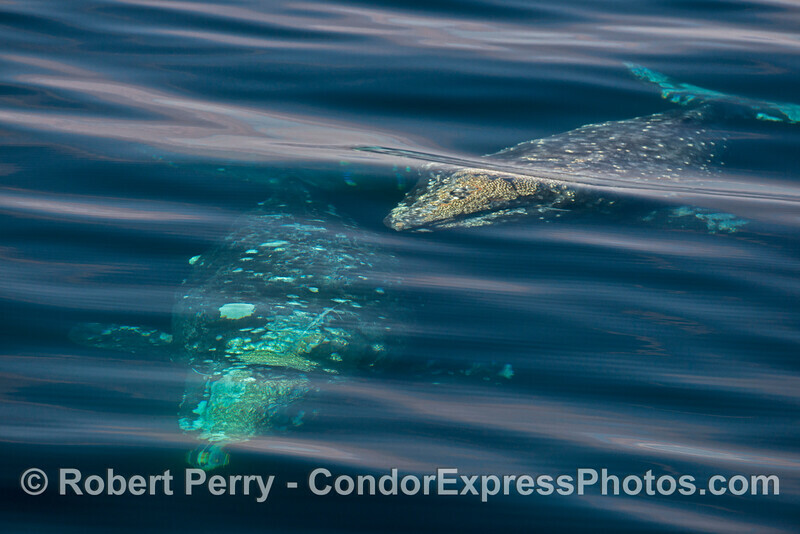 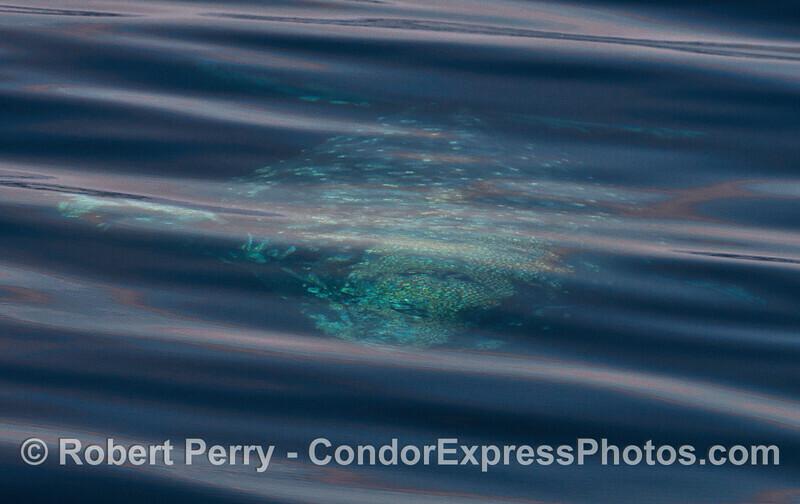 This was determined by seeing the 2 whales shining blue under the crystal clear water where they were swimming. 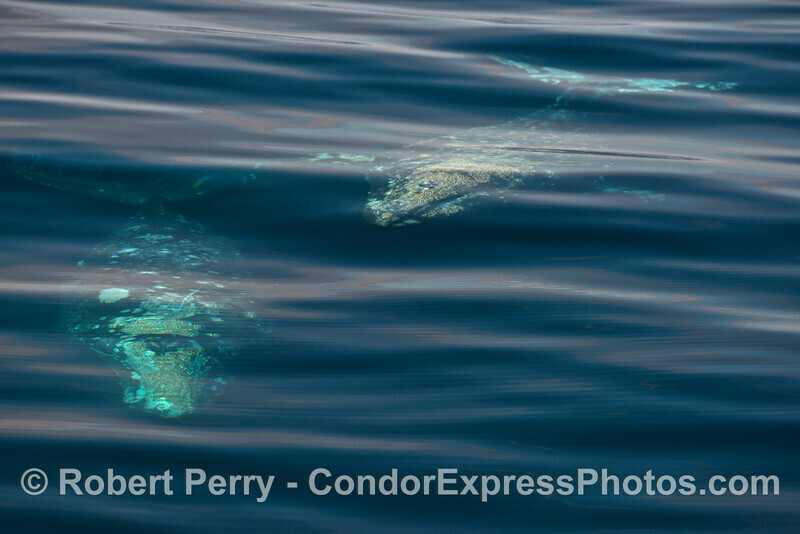 Soon the 2 whales were side by side, right next to the port side of the Condor Express, submerged about 15 feet below the surface, with stupendous underwater visibility. 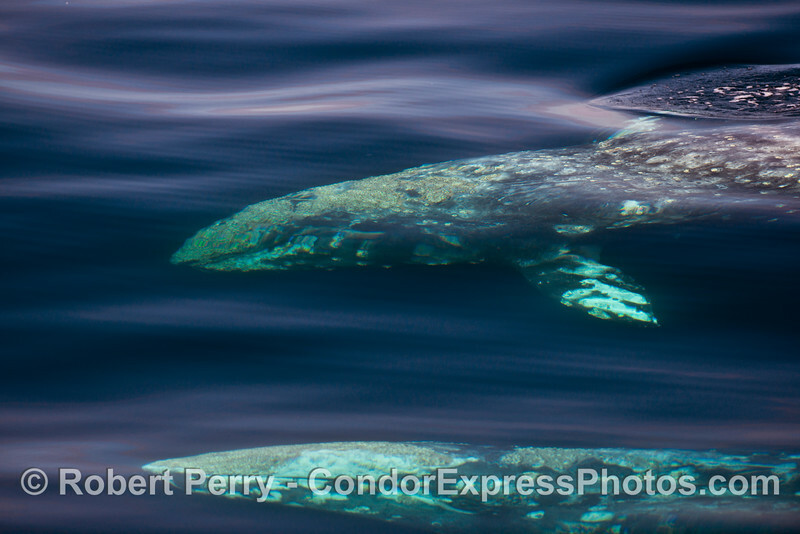 The whales came close, then banked a turn to the west and in doing so traversed the length of the boat under water for all to see. 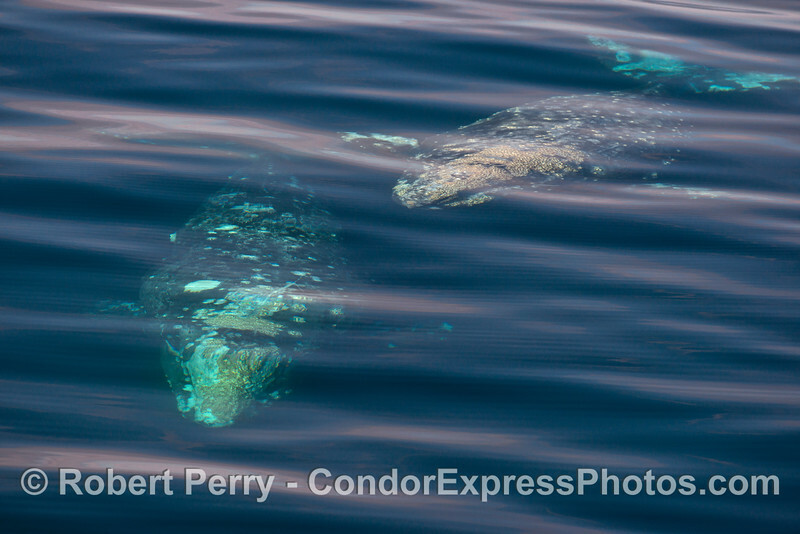 The sight of these two whales was so clear under these clear water conditions, that every single barnacle and scratch could clearly be seen...and every detail of the flukes, flippers, mouth and eyes were also seen. 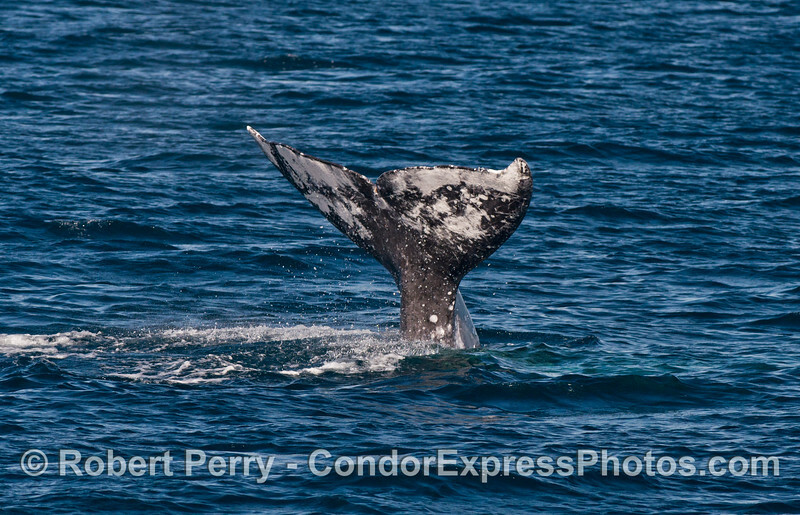 It was one of those magic moments and it was a privilege to be there with a camera. 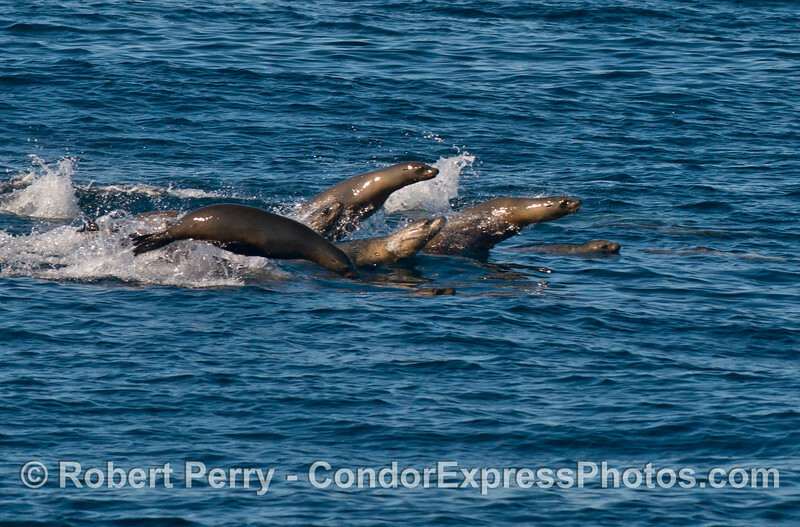 You can check out the map at the bottom of the photographs to see where we went.